Big Creek Lumber’s sawmill, located in Davenport, California, manufactures and wholesales a wide variety of redwood lumber products to independent wholesalers, stocking distributors and remanufacturing facilities. The sawmill produces approximately 20 million board feet of redwood lumber annually. We are well known for producing high quality redwood products and providing an outstanding level of personalized service. All of the lumber produced at our sawmill comes from timber that is locally grown and harvested from the Santa Cruz Mountain region. We are known for our sustainable forestry practices that conserve our productive redwood forests for future generations. California redwood is a softwood that is prized for its ability to withstand a wide range of environmental conditions while maintaining its structural integrity for decades. It is naturally resistant to insect damage and is recognized for its fire resistance. Redwood’s natural durability, stability, strength and beauty make it popular for both outdoor and interior applications. Big Creek Lumber manufactures many dimensions and grades of redwood. We are noted for producing quality decking, fencing, sidings, fascia and trim. We also offer a wide range of custom cut timbers and carry a limited supply of redwood slabs for specialty projects. We have the flexibility to surface, profile, resaw, trim, custom pull, end-wax or wrap the redwood products we manufacture. We can custom make beams from 6” x 6” up to 24” x 24” and we offer beams up to 24 feet. Our sawmill can mill longer beams on a special order basis. Big Creek Lumber’s sawmill by-products are utilized to produce 100% pure redwood mulch products. We produce redwood sawdust mix, redwood shavings and shredded redwood bark. These products are outstanding for use as soil amendments and for landscaping groundcover. They are sold in truckload volumes and are picked up directly from our sawmill location in Davenport. While primarily a redwood sawmill, Big Creek Lumber periodically mills Douglas-fir lumber as well. Douglas-fir trees grow naturally in our local redwood forests. The quantity of Douglas-fir timber that we harvest and saw varies from year to year, but typically makes up about 5 % of our annual lumber production. When Douglas-fir is milled, we manufacture both dimensional lumber and timbers. 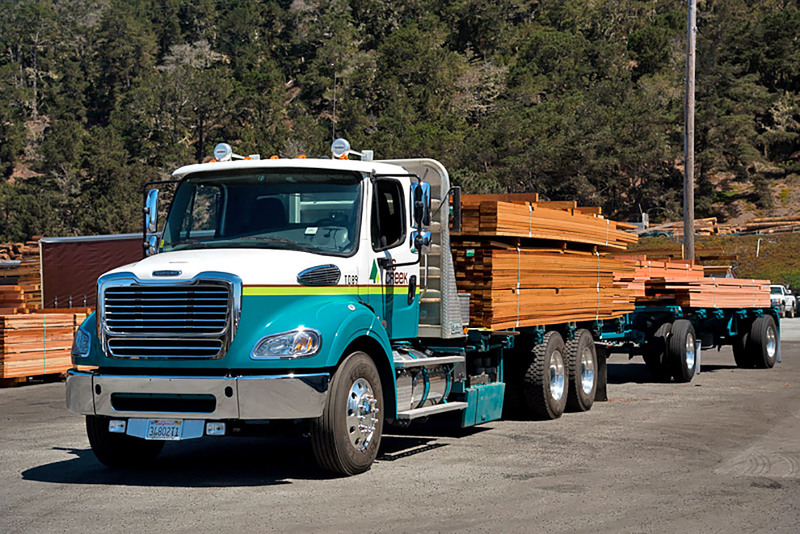 Big Creek Lumber has its own local delivery fleet and also engages or refers reliable logistic carriers. Wholesale customers may take delivery of their order at our Davenport sawmill location, or we can help arrange to have it delivered. For those customers who might be interested in overseas export, we are located approximately 80 miles from the Port of Oakland. Our loading hours are Monday through Friday, 7:00 a.m. to 2:30 p.m. If you are an independent wholesaler, stocking distributer or operate a remanufacturing facility contact our Davenport team. Each has decades of experience and will do their best to provide or help you source the right supplier for your redwood product needs. Kathleen Burson Kathleen has assisted the team since 2003. She is primarily responsible for inventory control and invoicing. Big Creek Lumber’s redwood sawmill sales office is open for inquiries Monday through Friday between 7:00 a.m. and 5:00 p.m. Our truck loading hours are Monday through Friday from 7:00 a.m. until 2:30 p.m. This location is not open to the general public. If you are a contractor or homeowner, we are happy to direct you to one of five Big Creek Lumber retail lumber and building supply yards. Take our virtual sawmill tour.